In 2018, many new concepts will be offered like the "Strange Gala" on Friday night, the "Kids Gala" Saturday afternoon and of course our "International Gala" Saturday night with 7 renowned artists. You will have the chance to see during that gala: Bill Abbott, Juliana Chen, Éric Leclerc, Max Maven, Xavier Mortimer, Xavier Tapias and Daniel Coutu as Emcee. Since the Festival also organises the CAMarederie in 2018, the magicians will have the chance to see 9 lectures from Bill Abbott, Stéphane Bourgoin, Juliana Chen, Max Maven, Xavier Mortimer, Xavier Tapias, Christopher Taylor, Marc Trudel and R.Paul Wilson. Prices will raise on January 1st, 2018. You can also register for the Magic School that will offer different levels during the week-end. You can also join the Club de Magie du Québec. Its mission is to support magicians who want to compete at high levels of competitions. You can also register to our 6th Edition of the Concours International de magie "Michel Cailloux" with $4000 in prizes for the winners. 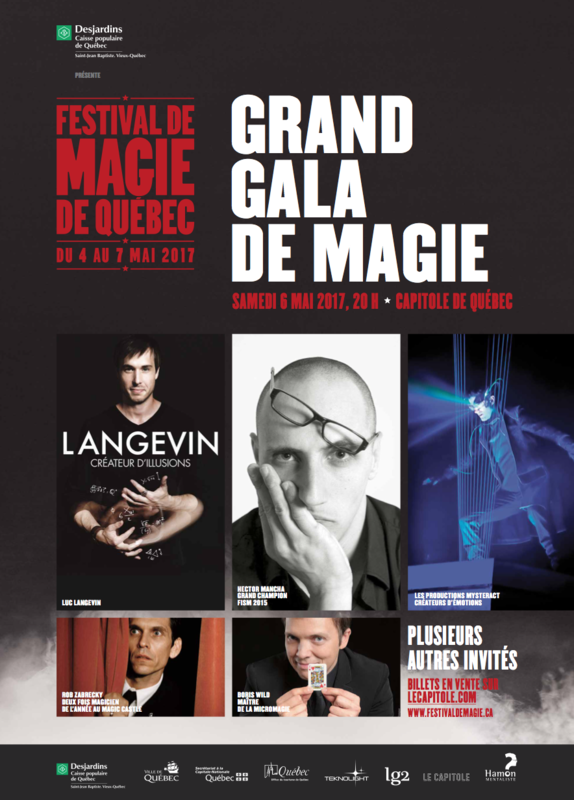 The Festival de magie de Québec starts on Thursday. I am a big fan of their creative, dynamic, and often interactive advertising campaigns. In 2011 it was this magical billboard. In 2012, it was "la disparition." In 2013, "pouvoirs magiques." For 2014, "le balai magique." This one, "le magicien" (in English: The Magician) was released in August of 2015. And last year was "The Mysterious Billboard." For this year, have a look at "The panel that reads your thoughts." MAY 4-5-6-7, 2017 in Quebec City . Non refundable $45 (plus taxes) registration fee to process your file and have the Selection Committee evaluate your video. Deadline for registration: March 3, 2017, 5 p.m. Provide a Web address where we can see you perform for the first evaluation by the Selection Committee. Between March 3 and March 28, 2017. Four members of the Selection Committee will evaluate the videos. Choice of numbers for the pre-gala. Several finalists will be chosen per category. The Selection Committee may decide that there are not enough contestants and cancel a category. Names of finalists selected by category will be listed on the FMQ website on April 2, 2017. Presentation of Numbers on Stage during the Pre-gala in Quebec City. Finalists must present their number in Quebec City in front of jury on May 2, 2017. A presentation schedule will be emailed to the finalists April 10, 2017. Finalists can refuse the invitation anytime time. Finalists who refuse the invitation will be disqualified. All winners per category will be invited to participate in the magic contest gala. One winner per category will be chosen by the jury. Winners of each category will be awarded $500. Festival de magie management’s “Coup de Coeur” award: at its sole discretion, Festival de magie du Québec management reserves the right to admit a contestant to the gala competition. This contestant will not be eligible for the $1 500 award. From among the winners of the five categories, the magician who receives the most points from the five members of the jury will win the Michel Cailloux Grand Prize and the award of $1 500. ◦ For $50,00 + tx you will have professional pictures of your act. These pictures will be very useful to promote yourself. ◦ For $150,00 + tx you will receive a video of your competition act. 3 robotic cameras will be used resulting in 4K images. Imagine having a professional video for your web site promotion and to present your act to other competition registrations. • One of the participants of the under 18 years old category could win a scholarship to the Jeff McBride magic school in Las Vegas. Value of $800,00 US. • All under 18 years old competitor will be in the same category which will include stage and close-up magic. Thank you Jean-Luc for sending this information along! The Festival de magie de Québec starts today. I really enjoy their creative, dynamic, and often interactive advertising campaigns. In 2011 it was this magical billboard. In 2012, it was "la disparition." In 2013, "pouvoirs magiques." For 2014, "le balai magique." This one, "le magicien" (in English: The Magician) was released in August of 2015. I had the pleasure of meeting Eric at Sorcerers Safari in 2011. He's a fabulous addition to this year's list of performers! ... our guest, Shin Lim, unfortunately got injured and will not be able to perform magic for a few weeks. He had to cancel his visit to the CAMaraderie in Québec. We wish him a prompt recovery and hope to have him with us in the next years. Good news, we will have the chance to have Eric Jones, close up specialist, in Québec city for the CAMaraderie. He will do a lecture, he will perform in the close-up gala and in the grand gala on the Saturday night. This will be a great occasion to meet this exceptional magician. ... notre invité Shin Lim s'est malheureusement blessé à la main. Il ne pourra pratiquer la magie pendant quelques semaines. Il a donc dû annuler sa présence à Québec. Nous lui souhaitons un prompt rétablissement et nous espérons que nous pourrons le recevoir dans le futur. Bonne nouvelle, nous aurons la chance de recevoir le magicien Eric Jones, spécialiste de magie de proximité, à Québec lors de la CAMaraderie. Il offrira une lecture en plus de performer lors de notre gala de micromagie et du grand gala du samedi soir. C'est une occasion exceptionnelle de le rencontrer. Quebec City Magic Festival ad "The Magician"
One of my favourite things about the Festival de magie de Québec is their creative, dynamic, and often interactive advertising campaigns. In 2011 it was this magical billboard. In 2012, it was "la disparition." In 2013, "pouvoirs magiques." For 2014, "le balai magique." This one, "le magicien" was released in August of 2015. So much fun!